"New Internal Cavity X-ray Technology for Airports"
"Opposition Forces In Pennsylvania Moving On REAL ID"
Why Schweitzer is not on good terms with "nullification", and why that's okay. BTC Commentary -- Our Constitutional Bill of Rights are being perpetually scrambled, challenged and re-challenged. The name of the political game is to get you maneuvered out of your rights. Why should a battle over your 10th Amendment be any different? The 10th Amendment is about powers reserved to the States. States have it and States use it. However, they seldom make a public or corporate ceremony about invoking use of the 10th Amendment. However, when states do a corporate move to kick a federal law back to Washington it is called nullification. Governor Schweitzer recently publicly knocked the principle of nullification. Loud, patriotic belly bursts of declared independence over States' rights doesn't go over so well with Democrats. However, he had no problem exercising his State's right to dump federal regulations of the Real ID Act over the rails. He just didn't dare say out loud, "I'll be invoking my 10th Amendment now." He simply did it. Wisconsin union workers who overran the State capitol recently with protest signs and vigils didn't say, "I am now using my 1st Amendment rights". In similar fashion, Ollie North said, "I can't recall," instead of "I plead the 5th." 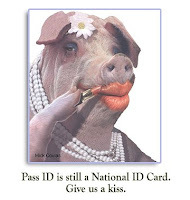 And in the same manner 25 States across the nation showed DHS they weren't implementing Real ID by the federal deadlines, footing the expense. This was nullifcation by action versus a direct corporate ceremony with one chief or constituency taking credit. 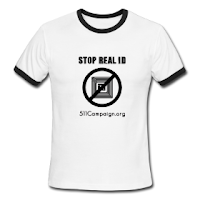 Shortly thereafter, the Tenth Amendment Center stated, "The United States just nullified Real ID by the right of the 10th Amendment!" And it was true. It seems invoking the 10th Amendment right is something Democratically led States can't be openly proud of. In fact, it is seen by some Democratic interests as almost amoral or at type of political impropriety. How could a corporate use of the Bill of Rights be considered immoral? The first reason is strictly political pragmatism. Many Democrats consider it "immoral" for States to opt-out of federal tax strategies. Any move against government solvency structure by a State is sacrosanct. States have to pay tribute to keep Caesar's lights on. Otherwise, there is no grand government plan which can be sustained to serve the plebean hosts. 2) A code word that politicians use to signal to racists that they too, are racist. Used in the past to signal that you support segregation and Jim Crow laws. When Strom Thurmond said he believed in State's Rights, he really meant that he wanted to keep segregation legal in the South. If you believe in States' Rights but want to pass the Constitutional amendment banning gay marriage, you are a hypocrite. The simple answer is that the racist south abused the 10th Amendment. Fast forward to 2011, Americans are suffering with not just expensive government but really poorly executed government, with bad policy, resulting in the passage of blatantly unconstitutional laws. These laws don't serve the long term interests of The People they represent. Corporations hire lawyers, which negotiate PAC service fees to elected officials, legislations are filed and passed; which then return regulatory contracts and business to their corporations. It's the new normal and the legislative circle of life. When a bad federal law is passed, State regulatory reforms are then bureaucratically dumped on State leaders desks. They are then expected to robotically comply because "IT'S THE LAW." Each State negotiates how bad is too bad, weighing federal consequences to its residents. State leaders had a succession of rude awakenings in 2007. Federal reforms became completely invasive to citizens once federal wiretapping laws like FISA took anchor, following train with the Patriot Act. Homeland Security started federalizing local police forces and then sought to issue a national ID card to each citizen in 2008. By 2009, we inaugurated a bi-racial president, but we have significantly less rights as Americans to life, liberty and the pursuit of happiness. Have we lost the forest for the trees? It is very obvious the federal government is not recovering important Constitutional boundaries, as promised, when Bush left office. In fact, the furrows grow deeper and the power grabbing grows closer to a totalitarian state as Obama seeks to silence whistleblowers, institute a kill switch for the Internet and use federal intelligence to surveil peaceful dissent. States have to be thinking quietly about the rights of their citizens and aspects of life they once enjoyed without federal intrusion. Some States are beyond thinking. They're beyond talking. They are using powers not delegated to the United States by the Constitution, nor prohibited by it to the States; [which] are reserved to the States respectively, or to The People. That's using the 10th Amendment. When several states use it for similar reasons, it's called nullification. I think some citizens of Montana don't care much what you call it; as long as they don't get a national ID card or any other federal measure going against the best interest of Montana. Governor Schweitzer shouldn't get mired down in owning the term "nullification". It's not like nullification will be an evasive option for Montana in the future. Someone will always dance to the cheesy piccolo tunes tweeted by the tri-cornered hat constituencies; he doesn't have to. I'm sure Montana will accept powerful action over political rhetoric any day. "New Texas legislation pitched as stalking goes high-tech"